The last morning I spent in Texas, my sister and I decided to wake up earlier to get breakfast and spend some quality sister time together. We went to a crepe restaurant around Rice called Sweet Paris Crêperie. It doesn’t look too big from the outside but there’s quite a bit of seating once you get inside. Sweet Paris is adorable and their staff is very friendly; they make and serve both sweet and savory crêpes so you’ll be sure to find something you like! We ordered off the breakfast crêpe as well as the regular crêpe menu and both my sister and I went for the savory crêpes. We went not too long after it opened so it was mostly empty but as the morning went on, more and more customers came in for their crêpe fix of the day. The crêpes are large and extremely filling but so delicious that you want to finish it all. I wish I could go back now and get another Alaskan (scottish smoked salmon, pickled red onions, capers, fresh dill, and two scrambled eggs, topped with dill sour cream)! Check out their adorable website and full menu here! For months before my trip to Texas, I had been constantly telling my sister how much I was craving fried chicken. She promised we could get some when I visited and that it would be excellent fried chicken. She definitely kept her promise; it was probably the best fried chicken I have ever had. Most of the time, fried chicken is either overly fried or too salty. These were fried just right with just the right amount of seasoning so my taste buds weren’t begging for water. The meat inside was tender and juicy (currently drooling over the thought of Frenchy’s fried chicken while writing this). 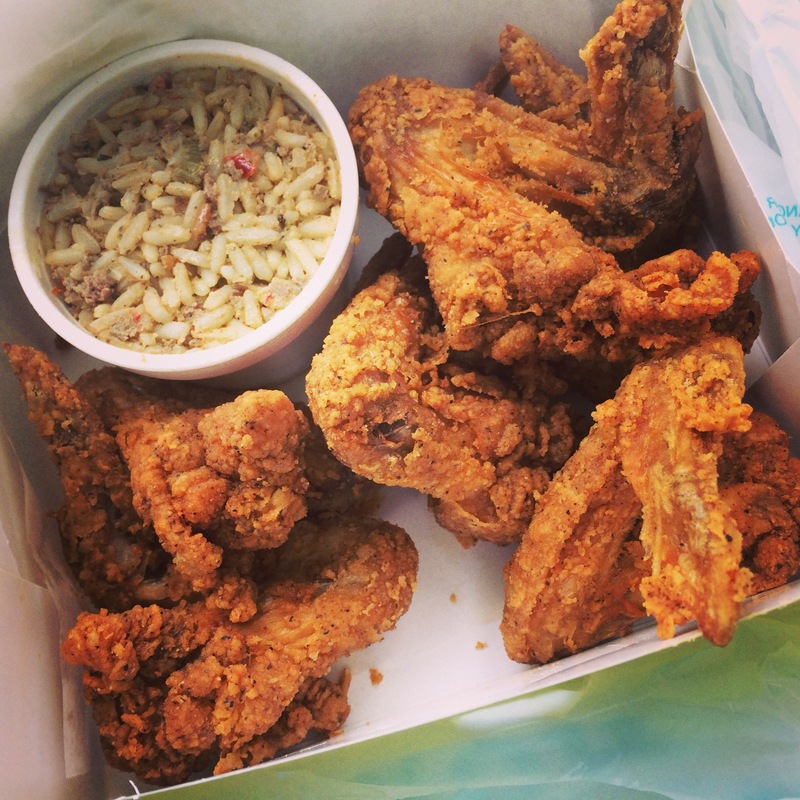 Frenchy’s is located in central Houston, in a African American neighborhood and may not look like much from the outside, but if you have time, go and get the chicken. The dirty rice it came with was equally as tasty. Grub Burger Bar is a modern and clean space with very dim lighting. Their burgers, however, are exquisite with one-of-a-kind names. They even have gluten-free options! Visit here for the full menu. Excuse the quality of the photo, the lighting was dim and I only had my phone with me. I got the “You’re My Boy Blue” burger which consisted of crumbled bleu cheese, balsamic caramelized onions, tomato and arugula. Boy, was it delicious! I love blue cheese but often times it can be too salty. This burger had the perfect balance of flavors. 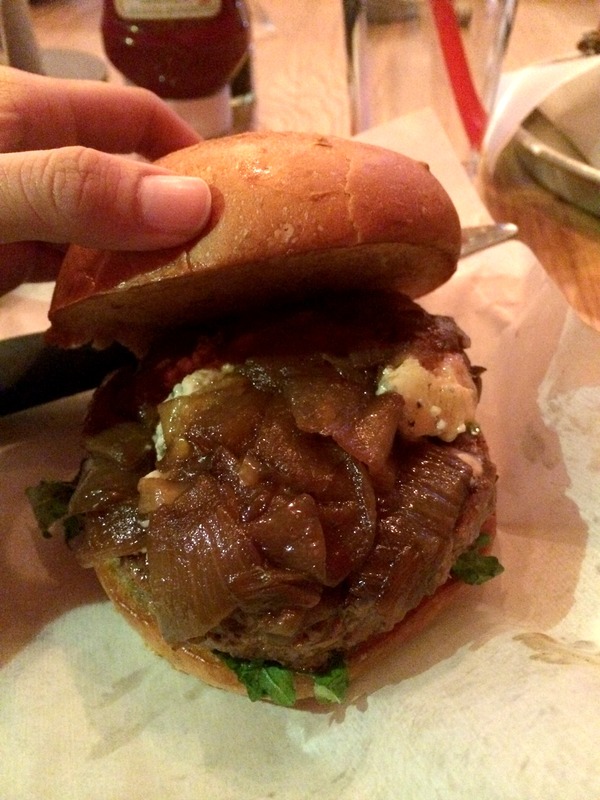 If you love blue cheese, this is the burger for you! Local Foods is one of my sister’s favorites places and I can see why. The café itself is quite spacious with a lot of seating in booths and tables. There’s also an outside strip to sit on along the road but the decor has a funky, a bit of a retro vibe to it. It’s brightly lit and the food is very fresh. Their sandwiches all looked absolutely satisfying but I went with their Crunchy Chicken (nut “crumble”, provolone, buttermilk ranch, pickles, pretzel bun) which is one of the sandwiches they’re most well-known for. With each sandwich, you can pick two sides. All of their sides looked really good but I ended up picking their kale and slaw. I also bought a cup of their Mintade which was a really delicious blend of citrus fruits and a refreshing mint aftertaste. We got our meal to-go but if you’re in the restaurant, you can have unlimited refill of their refreshing drink. The price of the sandwiches at Local Foods isn’t cheap but it’s definitely worth each dollar you spend. 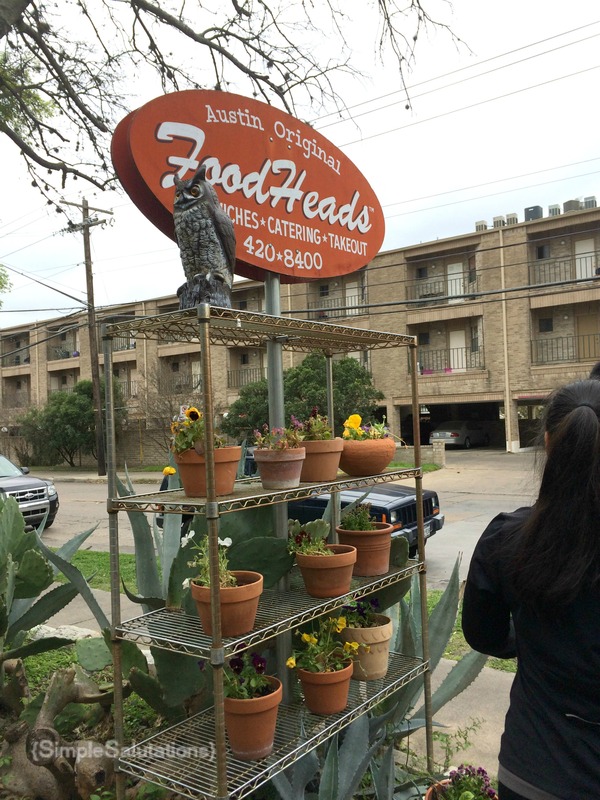 FoodHeads cafe is located in a quaint little house and serves some delicious sandwiches. It looks like a cute little house and has some indoor seating but also outdoor patio seating. It was nice enough to sit outside this afternoon and enjoy the fresh air, minus the humidity. There’s something about Austin that just loves color and this restaurant was no exception. There were color colorful chairs and table cloths on the patio with lights strung across the type for a homey feel. The sandwiches were priced between $7-$9 dollars but they are definitely worth it. Mine was a larger than I had expected and I had a hard time finishing it all but it was extremely flavorful and beautifully made. Of course, I had to order some sweet tea too! I absolutely loved the look, the food, and the atmosphere of this cafe. It’s definitely a place to check out if you’re in Austin and you love sandwiches (and if you love cute cafes)! They even have their own parking lot so you may not have to find/pay for street parking like many of the places around the area. Check out their menu and more pictures at their website here.